KOBANI: A Syrian father yesterday buried his wife and his two little boys, drowned as they tried to flee to Europe, while Hungary’s leader told Europeans they risk becoming a minority on their own continent. With desperation and anger deepening among people escaping conflict and poverty, around 300 migrants broke out of a Hungarian reception camp while about 200 others scuffled with police on a Greek island. Austrian police also said the driver of a truck found abandoned last week with the bodies of 71 migrants in the back was among a group of people arrested in Hungary. The Syrian family and the 71 migrants, who suffocated in the truck, were among many casualties as hundreds of thousands make their way by sea and land towards wealthy northern European countries such as Germany, hoping to find safety and a new life. Many are refugees from the four-year-old civil war in Syria. In the Syrian town of Kobani, 3-year-old Aylan Kurdi was laid to rest alongside his mother and five-year-old brother at “Martyr’s Cemetery” in the predominantly Kurdish community near the Turkish border. 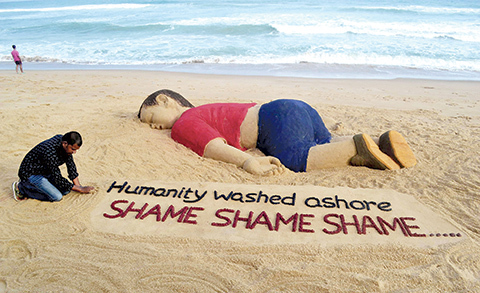 Images of the tiny body of Aylan washed up on a beach near the Turkish resort of Bodrum prompted a global outpouring of sympathy this week. He drowned with his brother Galip, his mother and nine others while trying to cross in a small boat to the Greek island of Kos just a few kilometres away. While pressure is rising on European governments to tackle the crisis more effectively, the boys’ weeping father, Abdullah Kurdi, called on countries closer to home to act. “I want Arab governments – not European countries – to see (what happened to) my children, and because of them to help people,” he said in footage posted online by a local radio station. Nevertheless, the head of the United Nations’ refugee agency, Antonio Guterres, called on Friday for Europe to mobilise its “full force” to help the migrants. In Austria, police said the 71 dead migrants found alongside a motorway near the Hungarian border were Syrian, Iraqi and Afghan nationals but not a single one of them has been identified. They included a baby girl and a young boy. The people had had enough air for no more than 90 minutes and appeared to have slowly lost consciousness, suffocating before the truck had crossed from Hungary. The driver was among five people arrested in Hungary, they added. In southern Hungary, around 2,300 migrants in the reception camp were threatening to follow 300 who had already broken out unless their demands were not met within two hours, police said. Many migrants are refusing to register in Hungary, fearing this will prevent them from getting to their preferred final destination, often Germany. Police gave chase to the 300 migrants and called a riot unit to secure the camp near the town of Roszke. Elsewhere, hundreds of migrants started walking from Budapest’s eastern railway station, saying they were heading to Austria. On the Greek island of Lesbos about 200 unregistered migrants trying to board a ship yesterday scuffled with police and coastguard officials. The UN refugee chief’s appeal contrasted with the tough line from Hungarian Prime Minister Viktor Orban, who warned about the consequences of “a mass inflow of people”, which he said could possibly number tens of millions. “It now has no other choice but to mobilise full force around this crisis. The only way to solve this problem is for the Union and all member states to implement a common strategy, based on responsibility, solidarity and trust,” Guterres said. More than 300,000 people have risked their lives this year trying to cross the Mediterranean, and more than 2,600 people have died doing so. Turkish authorities stopped 57 people trying to cross to the Greek island of Kos on Thursday night, as migrants remained undeterred by Aylan’s drowning on the same route. Hungary’s parliament passed a series of laws yesterday to control the flow of migrants into the country, giving police more authority and setting out strict punishments including prison terms for illegal border crossing. Orban defended his government’s hardline stand on the crisis. “The reality is that Europe is threatened by a mass inflow of people. Many tens of millions of people could come to Europe,” he said before the laws were passed. “Now we talk about hundreds of thousands but next year we will talk about millions and there is no end to this.” “All of a sudden we will see that we are in a minority in our own continent,” Orban told public radio. Hungary has hit out at Germany for saying it would accept asylum requests from Syria regardless of where they entered the EU. With the pressure growing, British Prime Minister David Cameron said his country would take “thousands more” refugees from Syria. Until now, Britain has taken in only small numbers of Syrian refugees, drawing criticism at home and aboard. German Chancellor Angela Merkel has vowed her country will not tolerate xenophobia, but a poll for ARD television showed her popularity has dropped abruptly over her handling of the migrant crisis. Merkel, who was criticised for being slow to condemn violent protests against refugees in an east German town last month, saw her approval ratings slip by 4 points from the previous month to 63 percent in the Infratest Dimap survey. That said, most European leaders struggling to revive their economies could only dream of a 63 percent approval rating.